The system consists of two separate components, a transmitter & receiver. The transmitter emits pulsed light in the infrared wavelength range. The receiver detects the light beam and immediately converts a beam interruption caused by an object in the sensing zone into a switched signal. The light only travels one way (from the transmitter to the receiver). Adverse effects in the applications, such as dust in the air, dirt on the lenses, steam or mist do not immediately interfere with the system. 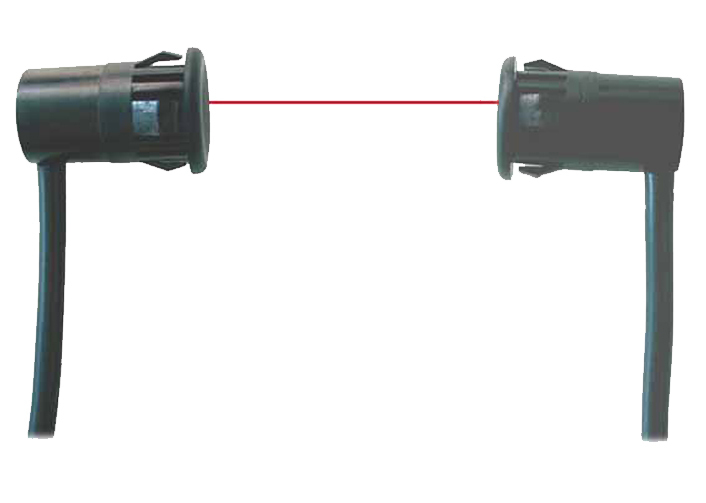 A through beam sensor is distinguished by a long range. The characteristics of the sensing zone can be described easily. An object must have at least the size of the optical axis, i.e. the size of the sensing surface or the lens to enable safe detection. Since the transmitted light only travels one way it is very difficult to detect transparent objects. The light beam is not sufficiently interrupted.